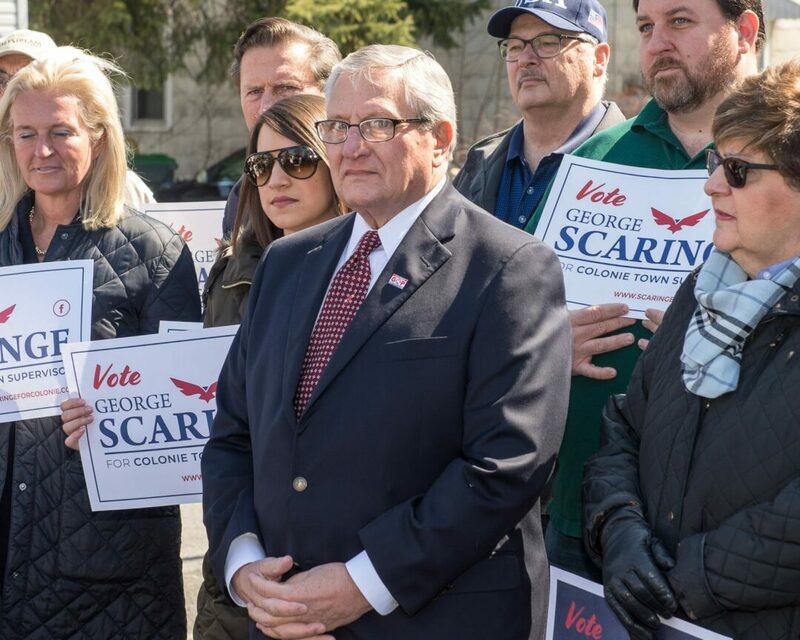 COLONIE — In the parking lot of the West Albany Italian Benevolent Society, and across Exchange Street from where he grew up, George Scaringe officially announced his candidacy for town supervisor. The Republican with a track record spanning more than five decades in local and state politics is endorsed by the Republican and Conservative parties and will take on six-term incumbent Paula Mahan when voters head to the polls in November. Surrounded by about 40 family members and supporters, Scaringe said he would run a professional, well-funded campaign and bring new ideas to Town Hall. Scaringe was the Albany County chairman and in 2016 he was elected chair of the Town of Colonie Republican Party. On his resume he can boast getting a Republican elected as county executive, Michael Hoblock, despite the Democrats having an overwhelming enrollment advantage, and getting Fred Fields elected as town supervisor. He touched on infrastructure needs like pot holes and town facilities, taxes and traffic congestion and development, which has been one of the more controversial points of the Mahan administration, as it is in any town. explained. We have to figure out where the money comes from, where it goes and find more money for infrastructure. Scaringe, a real estate broker, pledged to only serve two two-year terms if elected. Mahan, a Democrat, has won six times in a row in what was a Republican stronghold in the otherwise Democrat dominated Albany County. Two years ago, she beat Frank Mauriello, now the minority leader of the Albany County Legislature. Mauriello introduced Scaringe at the announcement, who said Republicans throughout history have been the ones who bring. Mahan beat Mauriello with 53 percent of the vote. There are also three Town Board seats up for grabs. Republican Chris Cary will seek re-election as will Democrat Paul Rosano. The other two Republican candidates are Rick Field, the owner of a real estate company whose father, Fred Field, served as town supervisor for 18 years; and Danielle Futia, the director of hospitality at Carondelet Hospitality Center, located in the St. Joseph’s Provincial House. The Democrats picked Brian Austin, who serves on the Planning Board, and Jill Penn, who works at the South Colonie School District and is married to the town’s Democratic Party Chair George Penn. Board members Linda Murphy and Melissa Jeffers Von Dollen, both Democrats, and Republican David Green are not up for elections. Republican Jennifer Whalen opted to not run again and is instead running for a seat on the Albany County Legislature. The supervisor serves a two-year term and the position pays $123,006 a year. The Town Board is a four-year term and it pays $21,479 a year.